Every Sunday through May 3rd, the Palm Beach Gardens Green Market will be open from 8:00 a.m. to 1:00 p.m., offering residents farm-fresh produce and other delectable goods from as many as 120 vendors. You might find juicy strawberries from Plant City, flavorful oranges and grapefruits from Indian River County, and even organic fruits and vegetables. Other items such as fresh seafood, just-baked breads and locally made cheeses are also available. Even though itâs a Green Market, itâs not just about food. On the first Sunday of each month (10:00 a.m. to 1:00 p.m.), vendors at the nearby Green Market Annex also sell handcrafted merchandise ranging from candles to jewelry to artwork. The City of Palm Beach Gardens juries all of the crafts to ensure that they are handmade and unique, not bought in bulk. There is also entertainment, ranging from local musicians to full live bands. 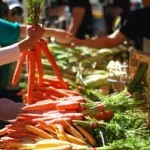 This is the 13th season for the Green Market and it gets larger and more diverse all the time. Every Sunday, an average of 1,200 people typically show up to shop, so why not join them soon? The Palm Beach Gardens Green Market is held at the City Hall Municipal Complex (it recently moved from the STORE Self Storage & Wine Storage). The complex is located at 10500 N. Military Trail. The Green Market Annex is located indoors at the Burns Road Recreation Center, 4404 Burns Road.